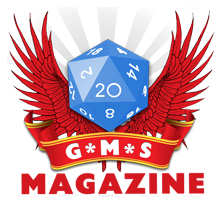 Welcome once more to the G*M*S Magazine Podcast. This time we have the most excellent Louis Porter Jr. Mind and genius behind LPJ Design. I talk to Louis about his many games, Wizards of the Coast, Kickstarter, the good times of being in the industry and the bad, the changes in the RPG world and what it is like to deal with writers and artist every day, while you still have to keep a job going. And you want to hear his answers! Louis is probably one of the most forthcoming people in the industry and one who’s not scared to call a spade a spade. Very refreshing! Also to let you know that this will be the last podcast in its current format. To celebrate the 1st anniversary of G*M*S Magazine, we’re going to make the podcast more interesting and full of goodness, and a new person will be joining our family, which is terrific. I won’t give too much away, but I will say one thing: You, the listener, will play a part. If you have an opinion (and I know you do!) about something to do with the industry or a particular game. If you have an article you’d like people to hear, send an MP3 with it to podcast@gmsmagazine.com and we’ll air it. As long as you keep the bad language to a minimum, it’s all good (or I’ll have to bleep out the bad words!). So get recording and get sending us your opinions. Make yourself heard! In the meantime, keep having fun gaming!